The guy behind the first great Twitter app is trying his hand at gaming. You may know Loren Brichter for the app that made him a rockstar in the iOS development community, Tweetie. Brichter was so successful with Tweetie that Twitter ended up hiring him to make Tweetie the official Twitter client for iOS and the Mac. Twitter for Mac has since fallen by the wayside, but Twitter for iPhone and iPad both live on as a testament to Brichter’s legacy. After spearheading the initial development of Twitter’s official clients for iOS and OS X, Brichter left the social network to do his own thing again. For the past several months he’s been working on Letterpress, a new iPhone and iPad game that’s now available in the App Store. The best way I can summarize Letterpress is by calling it a mix between Words With Friends, SpellTower and Scrabble. At its core, it’s a very simple word game that leverages Game Center to keep you coming back for more. 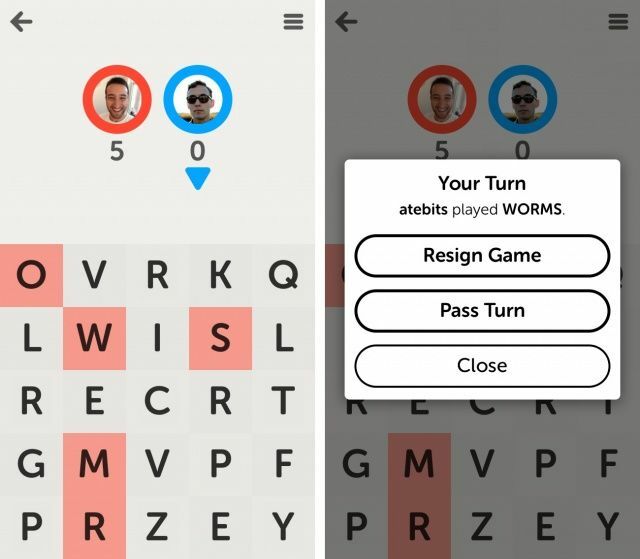 You start a game with a friend from Game Center and create words to win. Each turn is submitted and updated through Game Center, including push notifications for when your opponent plays a turn. I don’t think many iOS games have implemented Game Center properly. Letterpress is the kind of the game that was made for it, and I suspect you’ll start actually wanting to use Game Center after giving it a try. – Words must have at least two letters. – Words may only be placed once. – Words may not be a prefix of a previously played word. For example, if Player 1 plays the word “QUILTS”, Player 2 cannot play “QUILT” (but “QUILTED” and “QUIT” would both be fine). There’s also the concept of defending your tiles. When you play letters, they become colored to match your profile. The goal is to color the most tiles by the end of the game, and you can protect tiles you’ve already played by surrounding them with other tiles of the same color. When a tile has become defended, its color will become darker. You will also win if your opponent passes a turn. It’s the attention to detail that sets Brichter’s apps apart. The simplicity and animations of Letterpress makes it a joy to use, and everything feels intuitive and snappy. I was struck with how much the overall design of the game looked like the Windows Metro interface. Perhaps it was intentional, or perhaps it just meshes nicely with the tile-based gameplay. 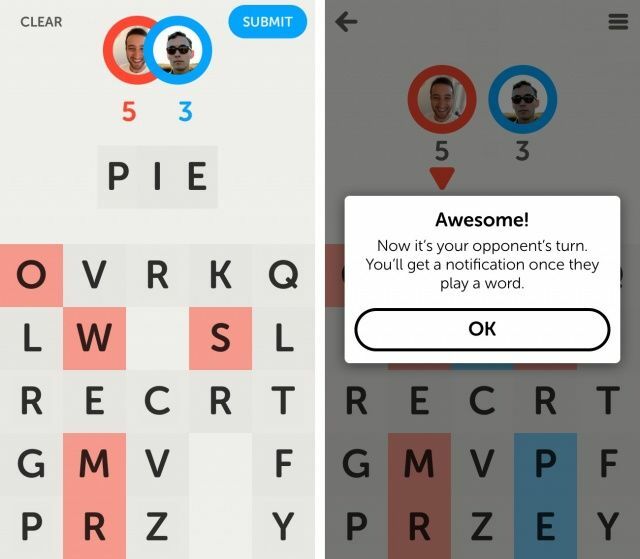 Letterpress isn’t going to change your life, but if you like word games, you’ll love playing this one. I can’t wait to see what Brichter has planned next. You can get Letterpress now for free in the App Store. 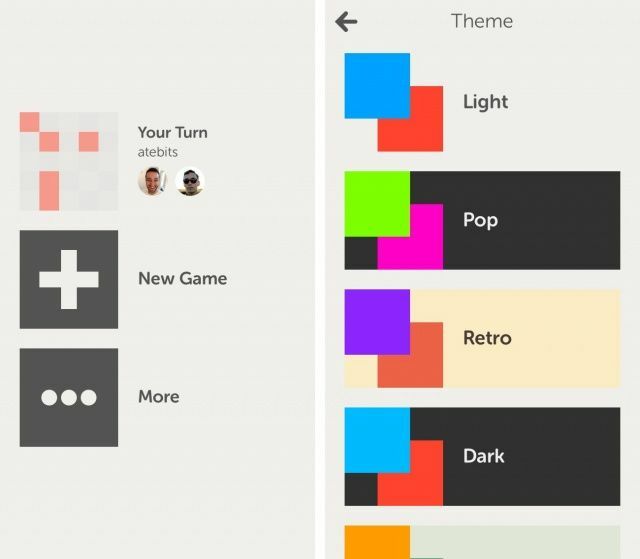 A $1 in-app purchase unlocks a few themes, the ability to see played words during a game, and the ability to play multiple games at once.